Welcome to Emerald City Soap! I'm in the process of moving from Michigan to Salem, OR, and I need to sell as much of this inventory as possible to do so! Stock up NOW while the price is super low! We're trying out some new scents and hope you all love them as much as we do. All our bars are 4 oz each, and are all natural, vegan soaps that are good for you and good for the environment as well. We will be adding new scents regularly, so be sure to keep checking back. Now then.... LET'S GET BUBBLY!! FLASH SALE! All Bars are marked down 40%! These bars are all packaged in individual boxes. If you are interested in BULK or WHOLESALE pricing, please click here. Unscented Oatmeal - Super gentle and creamy, with finely ground oatmeal to help exfoliate. Beige bars with tiny oatmeal flecks. Lemon Drops - Bright, refreshing, sweet lemon scent. Very reminiscent of Lemonheads candy! YUMMY! Creamy pastel yellow bars. Great Outdoors - Like stepping outside your tent and taking in all the wonderful aromas of the outdoors - fresh air, trees, water and a crackling campfire. Creamy bars with various shades of greens and browns. Midnight Lavender - Made with activated charcoal, and sweet, soothing lavender. Gorgeous black bar with delicate lavender swirls across the top. Midnight Rose - Made with activated charcoal, and soft, sweet rose. Gorgeous black bar with delicate pink swirls across the top. Midnight Mint - Made with activated charcoal, and invigorating mint. Gorgeous black bar with delicate green swirls across the top. Mint Chocolate - Rich chocolate with creamy peppermint YUMMMM! Layered bar with chocolate brown on the bottom and soft green peppermint on top. Apple Pie - Sweet, crisp apple pie, laced with cinnamon goodness! Cream colored bars with red and brown swirls. Cucumber Melon - Bright, refreshing, sweet and invigorating! Green bars with lightly colored swirls. Lilac - The soft, sweet and absolutely heavenly scent of Springtime in the palm of your hand. Creamy white bars with swirls of green and violet. Oatmeal & Honey - What a great way to start your day. Contains finely ground oatmeal and coconut milk. Tan bars with tiny flecks of oatmeal. Fresh Hands - Made with coffee and super-fine coffee grounds. These bars are great for removing kitchen odors from your hands. They have a refreshing citrus scent. Light brown bars with coffee ground specks. Cafe Mocha - Divinely decadent, rich dark cafe mocha! Deep brown bars with creamy swirls on top. Fresh Mint - Sweet and invigorating mint - the perfect way to begin your day! Pastel green bars with white swirls. Sandalwood - Calming and enlightening sweet, woodsy sandalwood. 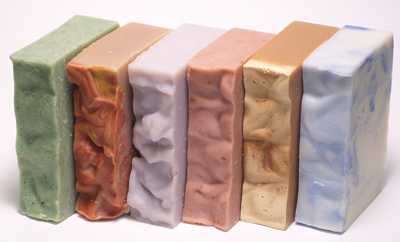 These bars are cream colored with soft brown swirls. Michigan Breeze - Refreshing and invigorating, with the cool scent of a Upper Peninsula pine forest. It's Pure Michigan! White bars with beautiful blue swirls. Patchouli - Release your inner hippie! Feel uber-groovy with this sweet patchouli scent. Tan bar with rich brown swirls. Dragon's Blood - Earthy and sensual. It is mysterious, alluring and very romantic. Brown bars with yellow and red swirls. White Rose - Sweet and pure. Very calming and cheerful. Pure cream colored bars. Confetti - It's like a party in the palm of your hand! Cream colored bar with shreds of multi colors. Super fun! Bacon - Yes. It looks and smells like bacon. Because....... BACON! But, fear not, vegan friends! Absolutely NO little piggies (or any critters) were harmed in the making of these bars. For all orders to be shipped outside the lower 48 contiguous United States, please contact us for a shipping quote. THANKS!